We understand that the self is not a stable identity. It is a concept upon which we build and reflect. From the time we realize we are an “I”—as Elizabeth Bishop does in her poem “In the Waiting Room”—that becomes our first story. Described by some psychologists as our ideal or primary self, it becomes the story of our values and tendencies. This is the one called Borges. We continue to tell stories about that self, at times ones that compete with it. For some, especially addicts, another self emerges, one recognized as a fiction of a different order. This self is antithetical to the first self’s primary narrative and does things she cannot do. Such a person is aware that the self-serving lies the anti-self tells others are not compatible with the story of the first self, the universe of the first self. This is about getting what you want, what you want that the first narrative will not permit. 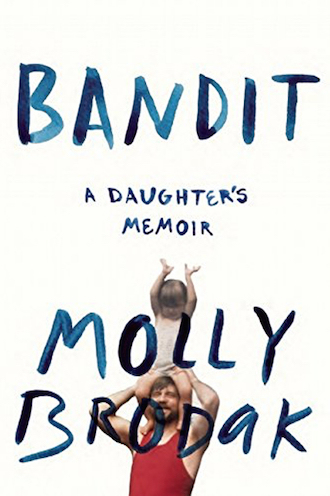 Molly Brodak’s father, the primary subject of her memoir Bandit, is an extreme case. He lies to his girlfriend, Brodak’s biological mother, insisting that he is not already married. Confronted with evidence that he does have a wife, and kids, he doubles down, inventing elaborate fictions to convince her otherwise. He compulsively gambles, furtively spending his “work day” at the casino. He then steals to cover his debts. Eventually, he robs banks in a paltry disguise that includes a Super Mario-style moustache. Even he is arrested, he vehemently argues that he’s been framed. All of it, a network of misunderstandings. In an idea-driven, determined, and gravely poetic memoir, Brodak searches for the stories behind her father’s behaviors. At times, she engages academic discourse on addiction and gambling in an attempt to understand his behavior, even grappling with sociologist Roger Callois’s mid-20th century theories of play. Such forays, while heady for a memoir, are absolutely relevant to understanding how and why her father develops a second narrative, a life in service of his addictions. But Brodak knows that definitive explanations of her father’s behavior are impossible. From the outset, she explicitly tells readers the facts of her father’s robberies, apparently admitting how powerless they are to tell his story. Later, confronted with the theory that her father is simply a sociopath, she resists. Reductive explanations may be soothing, but, as she notes, “I wanted the real version.” Besides, following Borges, does such a narrative of the self even exist? …I realized it was either the ring or dinner with friends at Denny’s later, where we’d hang out and eat cheap sandwiches and drink coffee. I wanted both so bad. I liked the idea of the mood ring, what a novelty: this will tell me how I am. The desire for the thing itself becomes the prerequisite for her subterfuge. “I wanted both so bad.” Only one of these items can fit into the primary narrative of the fifteen-year old author who works in a kitchen for her own spending money. She simply doesn’t have enough money for both. Later, in a virtuoso description of her own brain tumor surgery, Brodak appears to engage in an extensive caveat. Postoperative, she explores the sensation of being “headless,” functioning with a new control center. In aureate prose, she offers us something to laugh about, asking, “What does the world look like out of one’s ankles?” She quips, “It looks a little better, honestly.” The payoff pitch may come when she refuses to see her father following the surgery—one of the few times he makes a genuine effort at a relationship with her. To me, though, this chapter is a creative exploration of her own experience in a different reality, one in which she is acted upon. It is a break from constantly having to pilot one’s body through life. For some, being controlled by addictive behavior falls within this variety of experience. Consider the erstwhile apostle who does what he does not want to do, who does what he hates. So, why does her father lie, steal, rob banks? Why does he allow himself to live conflicting narratives, chronically saying one thing but doing another? In the end, Brodak is careful to distinguish between the ongoing behaviors of her father with the way she ultimately responds to her own stealing addiction. She writes, “And then, I just stopped.” Her father doesn’t stop. Perhaps these answers aren’t satisfying to those who prefer the illusion that we are simple organisms with unified selves. Fine. It isn’t a realistic expectation of memoir or biography to provide answers about how or why someone is the way she is or behaves the way she does. So tell the story honestly, compellingly, thoughtfully. Tell it with passion and commitment. Tell it, if you’re able, with poetic language. But don’t for a sentence believe that you know who anyone really is, least of all yourself. I do not know who has written this review, and I certainly do not know who has written this book.